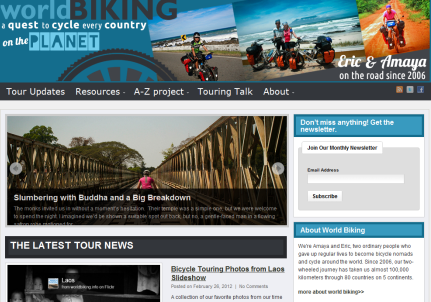 Soul Cycler Back on the Road – Go Bicycle Touring! Professional photographer and talented writer Rick Gunn is back on the road. If you missed out on following his earlier 25,000 mile round the world ride, you can now catch up with him as he cycles India. 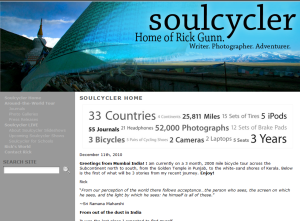 Although Soul Cycler isn’t as well-known as many bicycle touring blogs, it’s one of the best. Rick’s uplifting travel journals are full of anecdotes and insights. You’ll never be bored with banal accounts of which hostal he checked into or how many travelers he hung out with at the local pub. Halfway through the first mile, we’d asserted our place among the lowest rung of the vehicular hierarchy. So I signaled our arrival by ringing my bell. Reaching for their car horns, the drivers responded with an aural assault of such frequency–such sonic ferocity–that at any given moment it felt as though our tympanic nerves were being etched-out by a razorblades. All of this was tied together by India’s single unifying element. Dust. Like the Hindu deities themselves, it appeared in myriad form; omnipotent and all pervading. It permeated everything–sparing nothing. From the palpable airborne chunks that bounced off our helmets, or the thick-chalky grit that ground in our teeth–to the microscopic particulate that blotted-out the sun, this powdery manifestation of Shiva the Destroyer eventually took its toll on our eyes, throats, noses and lungs. By the end of the first week, the two of us would incur full-blown respiratory infections. If any of this engaged the Indian psyche, neither of us were privy to it. What did engage them–we soon found out–was the presence of a pair of foreign cycle tourists rolling through their neighborhood. ”Hah!” they’d shout in Hindi, “Look everybody! Here comes a pair of foreign freaks on bikes!” Though after the thousandth time, this would become painfully tiresome, more times than not, I would look up, only to discover a genuine smile, a sincere curiosity, or a heartfelt, traditional palms-together greeting of “Namaste.” (“The God in me recognizes the God in you.”) And so it was, on this, my third visit to the sub-continent–while I peered upon this crush of humanity, pulsing through their homes, businesses, and temples–that I fell in love with India and Indians all over again. While the writing is consistently good, the pictures are simply stunning. I’m talking National Geographic quality. The Soul Cycler Photo Galleries will make an impression on even the most jaded world cyclist. You could easily entertain yourself for an entire weekend browsing through the Soul Cycler archives. But be warned, there’s a strong chance that Rick’s writing and photos will inspire you to set off on your own round the world bicycle tour.